Would you help me with this meiping please. Is it authentic? Thank you. Thank you for your explanation. I think I know now what you mean with unnatural on my petal decoration. But since I am a slow learner, I am afraid I will come to you often. I wanted to add a comment... the main reason I think this is neither Yuan nor Ming is the lotus petal decoration along the foot and the foot itself. Looks like a simplified petal decoration, but in comparison to other stylized versions of this decoration it looks a bit unnatural. Pictures 2, 8, and the bottom look highly unnatural to me, and the shapes are a bit off. 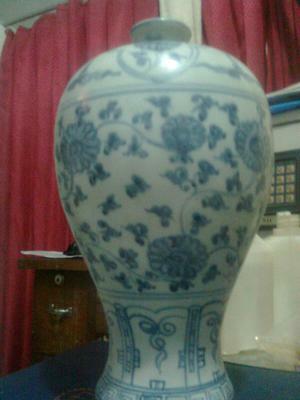 In my view this is a fake trying to look like a Yuan blue and white vase.